Training and Racing With a Power Meter Journal: Does drafting benefit the leading rider? Does drafting benefit the leading rider? by Andrew R. Coggan, Ph.D. - Based on aerodynamic theory, the power that a cyclist needs to produce to ride at any particular speed should be lower when one or more additional riders are drafting closely behind. This is because the “bow wave” of air in front of the trailing rider(s) helps to fill in the zone of reduced pressure that normally exists in the leading rider’s wake, thus reducing the leader’s aerodynamic drag. While this effect is widely recognized in auto racing circles (especially NASCAR), it has long been held that cyclists do not travel fast enough and/or in close enough proximity to each other for the effect to be measurable. Purely by chance, however, in 2007 I happened to collect some powermeter data on an indoor track that suggest that this may not be true. Despite considerable searching I have not encountered similar findings discussed or presented elsewhere, and so I would like to share them here. 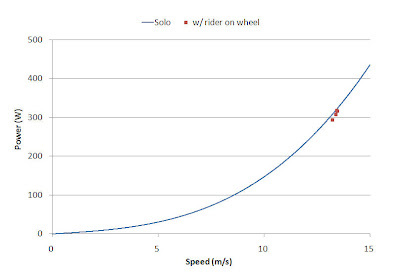 Figure 1 below shows, in blue, the power-vs.-speed relationship for an elite female pursuit cyclist when riding on the ADT Event Center velodrome in Carson, CA. These data were collected using an SRM Professional track crank during 12 x 1 km flying efforts performed at varying speeds to determine Crr and CdA on the track, and hence aid in equipment selection and pacing strategy. The results have been corrected for 1) minor variations in starting and ending speeds and thus in stored kinetic energy and 2) frictional power losses in the drive train (assuming an efficiency of 97.5%). The cyclist was in full race kit (i.e., race wheels, skinsuit, shoe covers, aerodynamic helmet), and the velodrome was empty except for one other cyclist who was performing identical efforts on the opposite side of the track (more on this below). Figure 1. Power vs. speed relationship when riding solo. The formal testing described above was conducted on the second day of a multi-day training camp. On the third day, the cyclist in question performed a workout that included 4 x 3 km flying efforts with a goal pace of 13.5 m/s (i.e., 3:42 for 3 km). They followed the same warm-up and used precisely the same equipment, position, and tire pressure as the previous day; air density (measured trackside using a Brunton ADC Pro) was also identical. Unlike the previous day, however, throughout these efforts the second rider mentioned above drafted very closely behind the “test subject”, as shown in Figure 2 below. Figure 2. Second rider drafting closely behind pursuit cyclist whose power data form the basis of this report. This was not a planned experiment, but simply reflected the desire of the drafting rider for an easier, but still high speed/high cadence, workout. Interestingly, however, the presence of this second rider seemingly reduced the pursuiter’s power requirement, as shown in Figure 3 below. Figure 3. Power vs. speed relationship when being drafted. Specifically, their power during the 4 x 3 km flying efforts was, on average, 9 (range 3 to 15) W lower (P=0.024 by one-tailed t test) than expected based on their power-vs.-speed relationship established the day before. To put it another way, having a rider drafting closely behind them apparently lowered their CdA by 3.2%, i.e., from 0.198 to 0.192 m^2. In terms of time saved, this would permit them to cover 3 km (e.g., in a team pursuit) ~1.5 s faster than riding alone, even if the following rider(s) never even “pulled through”. As stated at the outset and as reiterated in the paragraph above, this was not an intentional experiment, and so it is possible that other factors explain the small, but nonetheless apparently measurable, reduction in the leading rider’s power when another rider was drafting. 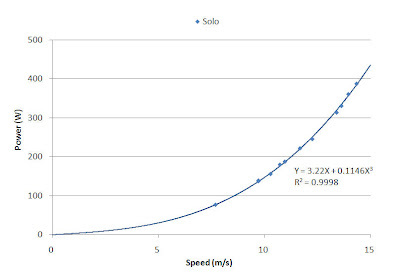 For example, it is possible that the presence of another rider on the track during the formal testing disturbed the air sufficiently to influence the power-vs.-speed relationship shown in Figure 1. Care was taken, however, to synchronize the two riders’ efforts so as to maintain approximately one-half lap (i.e., ~125 m) separation between them at all times. Furthermore, based on the reports of others if anything the presence of another rider on the opposite side of the track should have reduced, not increased, the power that the pursuit rider had to generate. Finally, as mentioned previously the CdA calculated from these data agrees exactly with that determined via wind tunnel testing. Thus, this explanation seems unlikely. Possibly a more plausible scenario would be that having the two cyclists riding together at high speed created more of a counterclockwise rotation of air than when the riders were on opposite sides of the track, i.e., on the second occasion the two riders were effectively drafting 250 m behind themselves (vs. 125 m behind each other). Indeed, it would only require a self-generated “tailwind” of 0.15 m/s to explain the observed difference in power, and standing in the infield at ADT I have measured wind speeds of >2 m/s when many riders are on the track simultaneously, e.g., during pre-event warmup. Arguing against this possibility, however, is the lack of any perceptible flow of air when the two cyclists were riding together (except immediately following their passing), as well as the fact that close inspection of the powermeter data failed to reveal any trends over time as one might expect if the riders were truly causing the air to start to swirl inside the building. In any case, I believe that these observations are intriguing, and I encourage anyone who agrees to undertake more formal theoretical or experimental studies of the phenomenon on their own. I have the Project 96 team pursuit data as well. However, it doesn't address the question at hand because Broker et al. did not report the power requirement when riding solo. Given the separation between them and the frontal areas, I don't believe the trailing rider can affect the pressure distribution on the leader enough to create a drag reduction of the magnitude observed. What I think may be going on is that the altered pressure distribution on the leader changes the separation point and this in turn is the direct cause of the drag reduction. The results of simulations on team cycling aerodynamics were posted in the article Taking the Drag Out of the Tour de France, also in issue 25 of magazine Dynamics in 2005 (http://terrengsykkel.no/ubb/images/attachments/49380.jpg). 2. The article you cite isn't directly relevant (i.e., drafting cyclists experience a DECREASE, not an INCREASE, in drag as described for "undulating objects" in that article).